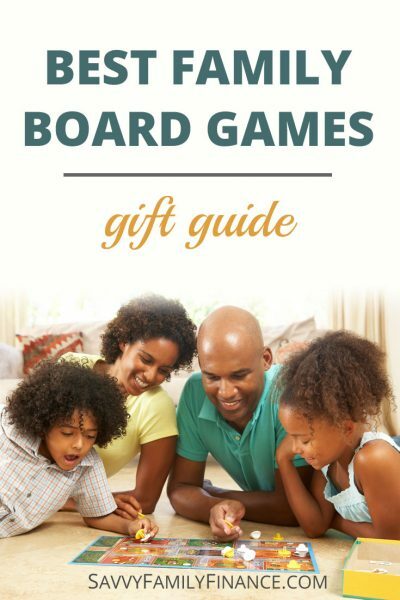 Inside: Find a list of family board games that are fun to play. Do your evenings consist of each person in the family looking at his or her own screen? A family game night can bring back interaction with your kids and significant other. The kids can work on problem solving skills, dexterity, and even language and math skills (but don’t tell them that!). Family game night also gives everyone a chance to work on their sportsmanship and social skills. Also, when the power cuts out on occasion, the kids know there are plenty of books and games around for entertainment and they can survive without a computer or tablet for a while. Below, you’ll find some games that are tried and true family games. Many of these we’ve played dozens (hundreds?) of times in our family. A few are newer, award-winning games your family should enjoy. This is a fun train themed game where players try and lay tracks between cities for points. This is a game that is likely to get a lot of play time in your home and become a family standard. Players draw cards and from there, select cities they must connect. If you fail to connect a city in your hand, you lose points! The player with the most points at the end of the game wins. This is a deck building game where whoever gets the most points wins. The recommended age is 13+. I would say kids should be at least 10 years old (which is about when our son started playing with us) and a good reader. Each game is a bit different as you can choose different cards to use in each game. Different cards give the players different abilities, such as being able to draw additional cards, trade, peek, and more. Players work to get the most points. In this cooperative game, players race to rescue treasures from a sinking island. This is one of my favorite games. It is easy to learn and lightweight enough for a relaxed family game night. Players are merchants who obtain gems to purchase cards. Some cards are worth prestige points and cards can also be used to obtain nobles. The first person to attain 15 points wins the game. In this race to the finish, you build a deck of cards that give you move options on a variable game board. Players use their cards to advance across the board. They can then use those cards to obtain new and better ones to aid them in the game. I would follow the recommended age of 10+, though some younger players may catch on as well. This is a 2017 Spiel de Jahres Winner (Game of the Year). Kingdomino is a kingdom building tile game that has play similar to dominoes. Each tile played must match existing terrain in play on at least one side. The order of play varies depending on tiles chosen and points are earned by claiming territory with crowns. This game is small enough to pack on trips! It is a fun card game that plays quickly. The kids pull this one out when they are bored. The storyline in the game is that you are trying to get your love letter to the princess while keeping others at bay. It’s the bean game! Here you have fun planting fields of beans (cards) to sell for gold. The graphics are fun and it is a good game for all ages. Our kids have played this with us since they were about 7 years old, even though the recommended age is 10+. Codenames is a game the ladies at game night are addicted to. It is that much fun. Teams work with clues to try and uncover the secret words for their team while avoiding the opposing team and an assassin. While this game allows 2-8 players, there is also a 2-person variant called Codenames Duet. This is a fun, lightweight game both kids and adults will enjoy. We have played this dozens of times and the kids always ask for more. You choose a character such as a monster, alien, or robot and roll dice to battle your enemies. Players may choose to attack, heal their wounds, or gain new powers. It is listed as being for players ages 8 and up, so it is fun for the whole family. It is easy to have a great family game night with these games. Set up the board or cards, get out some snacks, and have some screen-free fun. It is such a great way to connect with friends and the family!